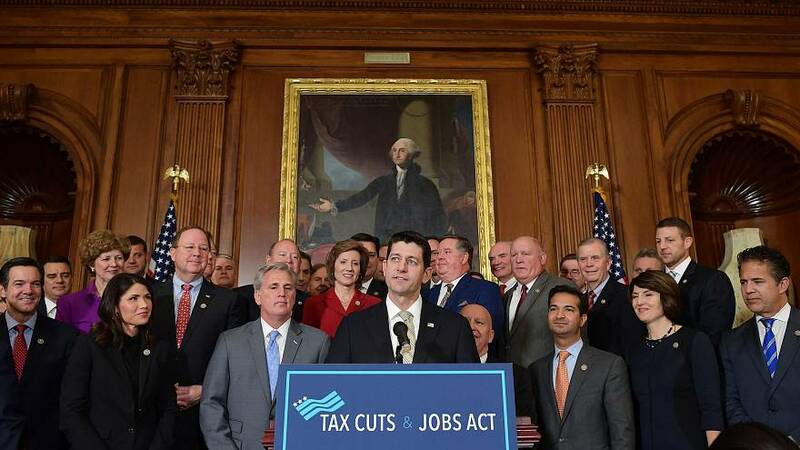 WASHINGTON — The tax plan that Republicans are soon expected to pass has grown more unpopular in the last two months, with nearly two-thirds of Americans believing it's designed mostly to help corporations and the wealthy, according to the latest NBC News/Wall Street Journal poll. In addition, the survey finds that Democrats have overtaken Republicans on which party better handles the economy — their first lead on this question since 2013 and their largest since 2009. But it also shows that Americans, by a 2-to-1 margin, believe President Donald Trump's approach has made the economy better rather than worse, which is one of the bright spots for the GOP in the poll. "A president is getting credit for the economy improving and not deriving political value from it," said Republican pollster Bill McInturff, who conducted the survey with Democratic pollsters from Hart Research Associates, referring to Trump's 41 percent job-approval rating in the poll. "We are watching things we have not seen before in my career." According to the poll — which was conducted before the House and Senate voted on the tax bill — 24 percent of Americans say that the Trump-backed tax plan is a good idea, versus 41 percent who believe it's a bad idea. That's an increase in unpopularity from October, when 35 percent said it was a bad idea, and 25 percent said it was a good idea. In the current poll, 53 percent of Republicans and 57 percent of Trump general election voters give the tax plan a thumbs-up, while 67 percent of Democrats and 75 percent of Hillary Clinton voters give it a thumbs-down. Notably, just 28 percent of rural Americans and 29 percent of whites without a college degree — key parts of Trump's 2016 base — say it's a good idea. "The GOP tax plan, theoretically, could motivate the base, but our poll finds that only 53 percent of Republicans think it is a good idea, while 67 percent of Democrats and a 45 percent plurality of independents say it is a bad idea," said Fred Yang, a Democratic pollster with Hart Research Associates. What's more, the NBC/WSJ poll finds 63 percent of Americans who think the Trump tax plan was designed mostly to benefit corporations and the wealthy, compared with 22 percent who believe it was designed to help all Americans equally. Just 7 percent say it was designed mostly to help the middle class. And majorities in the poll say corporations and wealthier Americans will pay less in taxes if Trump's tax plan becomes law, while a plurality — 37 percent — say middle-class Americans will pay more. In fact, the nonpartisan Tax Policy Center finds that only 5 percent of taxpayers would pay more in taxes by 2018 under the legislation, although that number grows to 53 percent by 2027 because many of the individual tax cuts expire after 2025. By 2027, more than 80 percent of the legislation's benefits go to the top 1 percent of taxpayers, the Tax Policy Center adds. The NBC/WSJ poll also shows Democrats regaining the advantage on which party better handles the economy and taxes. Thirty-five percent of Americans say the Democratic Party does a better job on the economy, versus 30 percent who say the Republican Party does a better job. That is the Democrats' first lead on this question in the poll since February 2013 (right after Barack Obama's second inauguration) and their largest advantage on the economy since July 2009 (months into Obama's first year as president). Additionally, Democrats now enjoy a 4-point edge on which party better handles taxes, 33 percent to 29 percent — their first lead on this issue in four years. "We've been having a major tax debate for two months, and [it] hasn't strengthened the Republicans' hand," said McInturff, the GOP pollster. And in the current poll, Democrats lead on dealing with sexual harassment (by 24 points), on looking out for the middle class (by 14 points) and on changing how things work in Washington (by 10 points). The Republicans' one issue advantage in the poll comes on foreign policy, with 34 percent of Americans saying the GOP better handles that issue, versus 33 percent who pick the Democrats. But while Democrats now lead on the economy in the NBC/WSJ poll, the survey finds that 40 percent of Americans believe Trump's approach has made the economy better, compared with 21 percent who think he's made it worse. However, Trump's numbers are upside down on the other issues the poll tested. By 53 percent to 28 percent, Americans say his approach has made America's standing in the world worse rather than better. By 57 percent to 17 percent, they say he's made bringing the country together worse. And by 58 percent to 9 percent, they say his approach has made the division and partisanship in politics worse rather than better. Asked whom they would blame if a major budget disagreement leads to a shutdown of the federal government, 31 percent of Americans would point the finger at congressional Republicans, 29 percent would blame congressional Democrats and 18 percent would blame Trump. And on the fate of the Deferred Action for Childhood Arrivals (DACA) program — which allows young adults who were brought to the U.S. illegally by their parents to stay in this country legally — 62 percent say Congress should continue it, while 19 percent believe Congress should take no action so the program ends. In September, 53 percent supported Congress continuing the DACA program, while 23 percent opposed it. The NBC/WSJ poll was conducted Dec. 13-15 of 900 adults — about half reached via cellphone — and it has an overall margin of error of plus-minus 3.3 percentage points.